Randall Moore, DNP, MBA, CRNA, chief executive officer of the nearly 53,000-member American Association of Nurse Anesthetists (AANA), attended the signing of the SUPPORT for Patients and Communities Act at the White House today. The AANA worked with members of both parties and in both chambers of Congress to help ensure that provisions allowing CRNAs and other advanced practice registered nurses the ability to prescribe MATs were a part of the final bill, an effort to increase the availability of these lifesaving treatments, especially in rural and underserved communities. The AANA also supported a number of important components of the final bill that would encourage the reduced use of opioids in emergency rooms and in pain management throughout the healthcare system. CRNAs are uniquely qualified and positioned to help mitigate the opioid crisis. With training in non-opioid and opioid-sparing pain management techniques in acute and chronic care settings, as well as Enhanced Recovery After Surgery (ERAS) protocols to reduce opioid use during surgery, CRNAs have an important role to play in dealing with the continued opioid crisis. The AANA commends the bipartisan efforts of Congress and the administration for signing this bill into law. We look forward to continuing to work with Congress and other stakeholders to address the ongoing opioid crisis and support the critical role CRNAs play in treatment. In the past, DNV GL Healthcare’s accreditation program for critical access hospitals (CAHs) required that, in most cases, a physician must direct all anesthesia services. Recently, after advocacy by the AANA, DNV GL Healthcare (DNV) updated that standard to require an “appropriately qualified practitioner to direct anesthesia services in accordance with State law.” This is good news for CRNAs. If CRNAs may direct anesthesia services in accordance with state law, CRNAs may be appointed to this role by the medical staff and governing body. Please note that the Centers for Medicare & Medicaid Services (CMS) does not require a director of anesthesia services in the Conditions of Participation for CAHs. DNV’s accreditation requirement for a director of anesthesia services in CAHs exceeds CMS’s anesthesia requirements in CAHs. With the updated standard, DNV now allows the facility flexibility to determine who is best suited for this role so long as it is in accordance with state law. Download DNV GL Healthcare CAH standards. The Leapfrog Group, a national healthcare nonprofit organization, driven by employers and other purchasers of healthcare, has expanded its public reporting to outpatient settings. For the first time, Leapfrog will collect safety data on ambulatory surgery centers (ASCs) through a new voluntary survey. In addition, hospital outpatient surgery departments will report similar data through a new section of the Leapfrog Hospital Survey, the organization's first rating system that has been gathering information about the quality and safety of inpatient care for almost 20 years. Both surveys will open in April 2019. AANA's Chief Clinical Officer Lynn J. Reede, DNP, MBA, CRNA, FNAP, is a member of the organization's national expert panel that will review and recommend content for the surveys to ensure the highest level of evidence and scientific validity. Students affected by natural disasters such as Hurricanes Florence and Michael need your help. The AANA Foundation's Student Emergency Educational Grant Fund is available to assist nurse anesthesia students who have been impacted by financial hardship and natural disaster. For students in need, apply for a grant. For those who can help, please donate to this important fund. Learn more about the AANA Foundation. 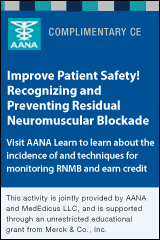 The AANA seeks to continually improve your online experience. Last October, we relaunched our website, www.aana.com, with a new fully responsive design to accommodate the desktop, mobile or tablet experience. So that we can provide you with an even better experience, we are seeking your insights on how well the website works for you. Based on past experience, this short survey should take about five minutes to complete. Thank you in advance for your valuable input. Application Deadline November 1, 2018. The AANA's Assembly of Didactic and Clinical Educators will be held February 13 - 16, 2019 in Houston, Texas. The AANA Foundation will be hosting a State of the Science General Poster Session at this meeting. The poster application can be found on the Foundation website at www.aanafoundation.com under Applications and Programs. The application deadline has been extended to November 1, 2018. Contact Bonnie Lowth at foundation@aana.com if you have any questions about the application process. The program consists of a Student/Mentor Meet and Greet from 6:00 - 6:30 p.m. on Wednesday, February 13th, for the mentor/mentee pairs to meet each other. Students are paired with an educator from a program other than their own. Thursday, February 14th, is the one-day mentoring experience. Wherever the mentor goes throughout the day, the student will follow. The mentor introduces their mentee to their colleagues, involves them in their discussions, and takes them to lunch. Please refer to the brochure for complete details about the program. Simply e-mail the Education department at education@aana.com to nominate a student and/or sign up as a mentor by December 10, 2018. We know obtaining malpractice insurance can be a tedious process. AANA Insurance Services has eliminated the hassle with our new Get Quote option, which allows you to quickly and easily request a quote* or get in contact with a knowledgeable representative who specializes in your state(s) of practice. Get started today. Missouri Governor Mike Parson has appointed Sheila Barrett Ray, DNP, CRNA, and Robert Walsh, PhD, MBA, MS, CRNA, to the Missouri State Board of Nursing. Sheila Barrett Ray works at the University of Missouri High Risk Obstetrics Unit for the School of Medicine in the Department of Anesthesiology. She has more than 40 years of nursing experience. Robert Walsh is a chief nurse anesthetist at Ste. Genevieve County Memorial Hospital, and has more than 25 years of clinical and professional experience. Ann Marie Maciej, CRNA, retired, and her husband Jim, who is a 1973 graduate of St. Cloud State University, St. Cloud, Minn., have donated $1 million to the university's nursing program. Ann Marie Maciej is a retired registered nurse, coronary care nurse and Certified Registered Nurse Anesthetist who spent 40 years in the healthcare profession, primarily at Fairview-Southdale Hospital, Edina, Minn. The Spirit of Jefferson reports that a "K-9 ambulance designed to meet the needs of the dogs in Jefferson County's [West Virginia] law enforcement units has hit the road." Michael McGuire, BAAS, CRNA, is the man behind the creation of the K-9 ambulance. "As far as I know, we're the first. Up until now, dogs injured on duty were just placed in a K-9 unit car, receiving no treatment on site. They had to wait to be taken to a vet. That's not the case now." Read more. Anesthesia Associates of Lancaster, an independent medical practice, has openings for nurse anesthetists to join our clinical team at a surgery center in Lancaster, PA, and an orthopedic specialty hospital and ambulatory surgery center in York, PA. The schedule is Monday - Friday, no call, no weekends, plus a $10,000 signing bonus. Learn more. Looking for a part-time / PRN CRNA for an office-based anesthesia position at a Northshore facility. Learn more. This CRNA position will work primarily in Oshkosh, WI and occasionally the Aurora Surgery Center (ASC) in Fond du Lac, WI. CRNAs work in a collaborative supervision model with the anesthesiologists. Monday through Friday variable day shifts. Call every 10th weekend and approximately once per pay period. Salaried position with additional pay for call. Annual quality bonus. Sanford Health Fargo Anesthesia Department is currently seeking Certified Registered Nurse Anesthetists (CRNA) to join its current group of 21 anesthesiologists and 72 CRNAs. Learn more. The Best CRNA Jobs: Connecting you to top employers in anesthesia. Targeted Email Alerts: You can automate your search by setting up email alerts that match your criteria. Plus, search through CRNA positions that fit your needs. Post Your Resume Anonymously: You're in control. Make your profile confidential and respond to employers with the best opportunities. New findings suggest that the efficacy of diagnostic nerve block is not a good indicator of surgical success for focal nerve injury. The study involved two dozen patients experiencing persistent postoperative pain or neuropathic pain related to injury of sensory nerves and sensory signs limited to the dermatome innervated by the injured nerve. Each of the 24 patients received an initial injection of 1% lidocaine, followed by a repeat injection two weeks later, and an injection of saline two weeks after that. The first and second lidocaine blocks had similar efficacy, and analgesic effect was collectively achieved in 54 percent of the 48 procedures. Three patients no longer needed surgery or additional pain treatment after that, but 16 of the remaining 21 moved forward with surgery. Out of that subset, 44 percent were rewarded with a permanent positive effect, while the other 56 percent did not benefit or saw their pain intensity deepen. Although the research was limited by the small sample size, investigators concluded that diagnostic blocks are a poor predictor of surgery outcome for focal nerve injury. The findings are reported in PLoS ONE. From "Predicting Success of Focal Nerve Surgery Based on Diagnostic Block Response"
An Ohio hospital is successfully using Enhanced Recovery After Surgery (ERAS) to perform surgery without intra- or postoperative opioids. All eight general surgeons at Cleveland Clinic Akron General adopted the protocol—which focuses on patient education, preemptive pain management, and multimodal analgesia. Researchers studied outcomes in 155 patients who had elective colon operations after the ERAS program was implemented in 2016. Only 15 used opioids before their procedures, while 140 had no preoperative opioid exposure. About 56 percent of the opioid users subsequently needed opioids to manage their pain post-surgery, versus 15 percent of non-users. Overall, 83 percent of the patients did not require postoperative opioids. Moreover, those who did need them tended to stay in the hospital longer: 2.7 days compared with 2.3 days. "Patient education played a large role in protocol compliance," according to lead study author Sophia Horattas, MD, "and patient satisfaction improved as they were able to avoid prolonged fasting, achieve improved pain control without the side effects of narcotic analgesia, and be discharged home earlier." The program's success was reported at the American College of Surgeons Clinical Congress 2018. From "Major Surgery Patients Without Opioids Have Shorter Hospital Stays: Research"
New evidence suggests that, when used during general anesthesia, neuromuscular blocking agents (NMBAs) may elevate the risk of postoperative pulmonary complications. Better known as muscle relaxants, NMBAs prevent muscle movement in unconscious patients—particularly those undergoing chest or abdominal operations and those requiring intubation for artificial ventilation. Outcome data from nearly 23,000 European inpatients receiving general anesthesia for non-cardiac surgeries and procedures show that risk of pulmonary complications rises with muscle relaxants but also that neuromuscular monitoring and use of NMBA reversal agents do not offset that risk. The POPULAR study concludes that anesthesia providers must weigh the potential benefits against the risks of postop pulmonary complications when considering the use of NMBAs. "Based on our results, we believe that patients undergoing minor surgical procedures that do not necessarily require neuromuscular blocking drugs might benefit from avoiding them," says Manfred Blobner, MD, who chaired the study's steering committee. "Using devices like laryngeal masks for anesthesia instead of tracheal tubes that go past the vocal cords could prove helpful, as well." The research appears in The Lancet Respiratory Medicine. From "Muscle Relaxants During Anesthesia May Increase Risk of Postoperative Pulmonary Complications"
The Nomenclature Consensus Working Group—a panel of global experts in anesthesia, neurology, and three other specialties—has updated the terminology used to describe cognitive changes related to anesthesia before and after surgery. The new language includes identifying anesthesia and surgery as a "potential precipitating cause" of postoperative delirium up to one week postoperatively or while the patient is hospitalized. Four other terms and definitions were also reworded and collectively published in several international specialty journals, including Anesthesia & Analgesia. The working group said the changes, which allow for formal classification and consistency, are needed because of the growing number of older adults being exposed to anesthesia and undergoing surgery. From "5 New Terms Describing Cognitive Changes Linked to Anesthesia"
The results of a retrospective analysis indicate that pectoralis nerve plane (PECS) block before mastectomy may increase pain relief and reduce opioid demand in patients. The team from the University of California Davis Medical Center considered unilateral or bilateral procedures performed at the facility from 2012 to 2016. During that time, 84 patients underwent the surgery, 41 of them receiving PECS block ahead of general anesthesia and 43 receiving general anesthesia alone. There was a meaningful reduction in opioid use intraoperatively as well as on the first postoperative day in the PECS group—although that benefit was not also evident in the post-anesthesia care unit. "Pain after mastectomy is often severe and PECS blocks play an important role in multi-modal analgesia for patients," noted Jon Zhou, MD, and his colleagues at the recent American Society of Anesthesiologists meeting in San Francisco. "It is a novel yet easy to teach technique that may decrease opioid consumption and its associated side effects as well as decrease prolonged hospital admission." From "Nerve Plane Block May Improve Mastectomy Pain"
Cleveland Clinic researchers have discovered that, unlike obese adults, children who are heavy do not report higher levels of postoperative pain. The team analyzed pain scores, on a scale of 0 to 10, for pediatric patients who underwent urologic, orthopedic, or general surgery at the institution between 2010 and 2015. There was no association found between body mass index (BMI) and pain in the sample, which included 513 patients at normal weight, 130 who were obese, 106 who were overweight, and 59 who were underweight. Investigators also did not observe a relationship between BMI and increased need for opioid pain relief. "We want to better understand the appropriate treatment for pain in the growing population of obese children who need surgery," said lead study author Syed M. Raza, BS, a clinical research assistant at the Cleveland Clinic Department of Anesthesia Outcomes Research. "It is important for clinicians to be aware of these findings as they may indicate that patients with higher BMI do not require higher doses of pain medication such as opioids after surgery." From "Unlike Obese Adults, Obese Children Don't Have More Pain After Surgery"